Therapy Ridge - Be Prepared to Breathe Deep! 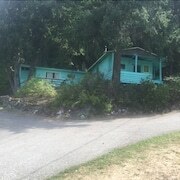 Blind Bay Vaction Rental - In The Heart Of The Bay! The hotel was quiet, we had great breakfast both days, and the casino was just across the street. Where to find Blind Bay hotels near an airport? Where can I find hotels in Blind Bay that are near tourist attractions? For vacationers visiting Salmon Arm and are looking for a comfortable hotel in Blind Bay, there are a variety of options. Within 0.1 kilometres (0.06 miles) of its central area, you can find 2 Expedia-listed accommodation options. 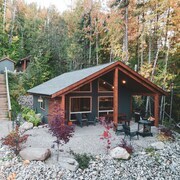 Hotel options that are fairly close to the city center of Blind Bay include the Shuswap Bed & Breakfast and Suite as it Gets Vacation Rental & B&B. 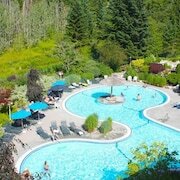 You could also check out the Prestige Harbourfront Resort Salmon Arm and also the Comfort Inn & Suites. 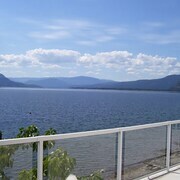 The Prestige Harbourfront Resort Salmon Arm is situated 20 kilometres (13 miles) away from downtown Blind Bay. The Comfort Inn & Suites, is 20 kilometres (13 miles) away. Two more hotels are the Best Western Salmon Arm Inn and the Podollan Inn Salmon Arm. 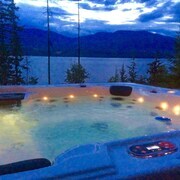 After you've enjoyed Blind Bay, you should make time soak up more of the Thompson Okanagan area. 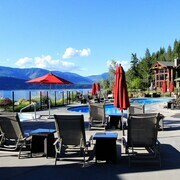 Thompson Okanagan offers rural landscapes, beaches and forests, and common Thompson Okanagan destinations include old towns. Active travelers may also try their hand at snowboarding and skiing in this part of Canada. Consider spending a few hours discovering Sunshore Golf Course and Adams Lake Recreation Conference Centre, in Chase, 20 kilometres (14 miles) to the west of Blind Bay. Some of our recommended Chase hotels and accommodations are the Quaaout Lodge and Spa, Talking Rock Golf and Jade Mountain Motel. Alternatively, you could consider staying at Sicamous, 25 kilometres (17 miles) to the east of Blind Bay, where you'll find the Best Western Sicamous Inn and Super 8 Sicamous. If you stay in Sicamous, set aside a little time to check out the Hyde Mountain Golf Course and Sicamous Centennial Park. Before you leave Salmon Arm, make sure you experience some local sport. Visit Interior Savings Centre to the west of Blind Bay. If you are keen on booking accommodation nearby, make a reservation in the Holiday Inn Hotel & Suites Kamloops or Hampton Inn by Hilton Kamloops. Our travel listing is also a very good way to discover more about Blind Bay. What are the most popular Blind Bay hotels? Are there hotels in other cities near Blind Bay? What other types of accommodations are available in Blind Bay? Explore Blind Bay with Expedia.ca’s Travel Guides to find the best flights, cars, holiday packages and more!